North Fork Spruce Roadless Area is a 36,000 acre stretch of land roughly 14 miles long, hugging the Selway – Bitterroot Wilderness along its eastern border, and Sneakfoot Meadows nestling the southwest curve (the area is also known as Elk Summit in conjunction with the adjacent Sneakfoot area). This parcel varies from .25 mile – 5.5 miles wide and encompasses highly diverse land types ranging from steep, rocky stream breaklands, to alpine glacial cirque basins, to loose colluvial and frost-churned uplands. Weathered rock and soil in this area is highly erosive, leaving much land located on the steep slopes unstable. 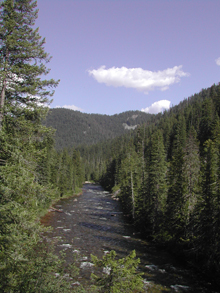 The main drainage is White Sand Creek, flowing from the Selway – Bitterroot Wilderness. Elevation is lowest here at 3,500 feet, and climbs to over 7,000 feet at Beaver Ridge Lookout along the northwest boundary. Excluding stream bottoms, most land sit above 5,500 feet. This steep country is entirely within the western spruce-fir forest ecosystem, except for a small section of cedar-hemlock-pine forest in lower White Sand Creek. Engelmann spruce, subalpine fir, western larch, and lodgepole pine are most common, leaning against the slopes and stretching their needled branches skyward. In lower areas, grand fir and western red cedar habitats occur. Most of the region boasts this mixed stand of trees, as well as shrubs such as spiny beargrass and false huckleberry. The varied terrain supports a prominent moose population, renowned throughout Idaho and considered one of the largest concentrations in the state. In addition to moose, moderate numbers of elk, black bears, and deer inhabit the area, as well as fisher, wolverine, Columbia spotted frog, and numerous other Region 1 sensitive species. Ungulates are provided a vital summer range, and the wet, high elevation of this upper Lochsa parcel is reported to shelter the rare Harlequin duck. The configuration of this country allows a great variety of recreation; the interior is networked with a well-dispersed 30 mile trail system. Excluding the vicinity of the lakes east of Beaver Ridge Lookout where some explorers hike and fish the 5 small lakes, cross-country foot travel is challenging due to dense vegetation and steep stream breaklands. Stream fishermen are drawn to White Sand Creek: many of the waters here run wild with rare steelhead, Bull trout, and Westslope – cutthroat trout. Colt Killed Creek is a key stream for salmon, steelhead, and the unique Bull trout as well. Hiking, backpacking, hunting, horseback riding, lake/stream fishing, photography, and blissful solitude are afforded among the intact natural integrity of this country. Past threats of massive logging projects and snowmobile use pose the most pressing threats to this irreplaceable country. While currently not included in the roadless area, the Rudd Moore Lakes area should be evaluated to see if it is a logical addition. A portion of the Upper Spruce Creek drainage was erroneously excluded in the newly defined roadless area and the boundary from 1987 (section 16) should be adopted. 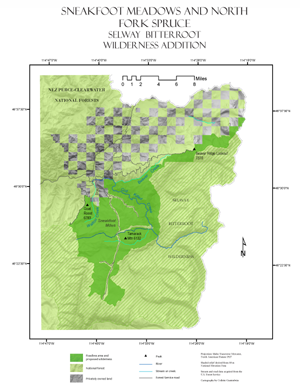 Further, proximity to other roadless areas and a contiguous boundary with the Selway – Bitterroot Wilderness, not to mention the impressive moose population, make North Fork Spruce a natural and significant addition to already protected wildlands.